MSU SPIRIT OF DETROIT MSU photo print picture art photograph for sale. 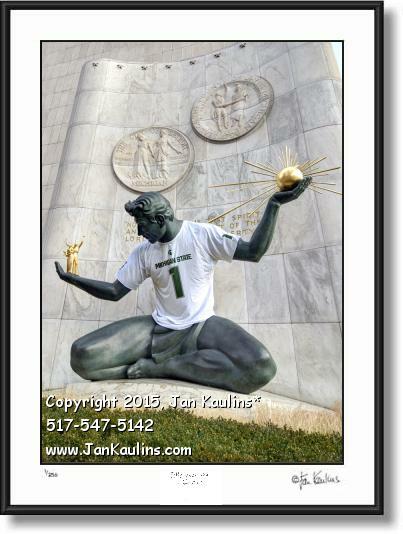 SPIRIT OF DETROIT MSU picture photo art print photograph for sale is of the MICHIGAN STATE jersey on The iconic Spirit of Detroit statue in downtown Detroit. The Spirit of Detroit has worn numerous jerseys in celebration of historic achievements (mostly in the field of sports) beginning withe the Detroit Red Wings jersey in 1997. This is the first time that a college jersey has had that honor. On the jersey we can see the bold words MICHIGAN STATE and the Spartan Helmet, icon for the MSU Spartans. The MICHIGAN STATE UNIVERSITY SPARTANS football team won the BIG TEN CONFERENCE CHAMPIONSHIP in 2015! Congratulations to The Spartans for their excellent season. This MSU SPIRIT OF DETROIT statue photo picture art print for sale wearing an MSU jersey was made from several bracketed photographic exposures and then tone mapped---a process that brings out the excellent detail and richness in color in both the highlights and in the shadows of the photograph.